Food Trends that you need to see for your 2018-19 Wedding! Everyone follows the fashion trends, but have you thought about following any food trend? Well, here are some food trends that you should follow to make your 2018 - 19 wedding more memorable! Let your guests take a trip down the memory lane with candy floss, popcorn etc. Plus the kids won’t whine. Win win! Everybody, I repeat, everybody loves donuts! Donuts will add the much requires oumph element to your wedding! Vodka shots are fine.. But have you ever thought about how cool will soup shots be? 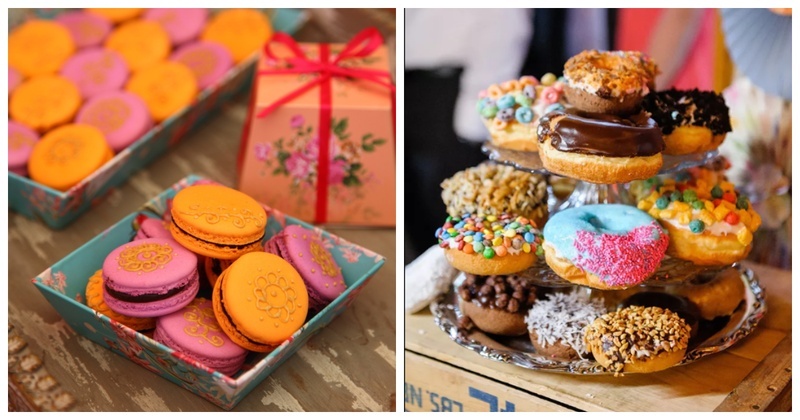 Customised or printed macaroons are slowly becoming the rage. By the time your 2019 wedding arrives, they’ll be a super hit. A macaron croquembouche sounds delicious as well! Easy to consume, bite sized appetizers are a great way to make your guests happy. A little splish splash here and there and you’re done! Comfort food can be a n number of things..daal chawal for some, burgers for others. Keep it simple, silly! Cones aren’t meant for ice creams only. Ask your caterer to experiment a little and to make chimney cones with delicious fillings. A little Budapest in India! Dark chocolate fountain is so yesterday! Make way for white chocolate, baby! Keep an assortment of marshmallows, biscuits and fruits to go with it. 9. Simple Desserts kept in a Fancy Shancy way! You don’t need a fancy dessert, just a fancy setting and a good DSLR! Make most of the subtle environment and don’t go overboard. So the food mantra is to keep it simple and light this wedding season!